If we select ‘Player Type’ = Footballer then on Player Benefits field on the Player table ,lookup should be open showing the records of footballer and similiary with the case of cricketer,for this to achieve we can use the relation called ‘Fixed field’ to accomplish this. 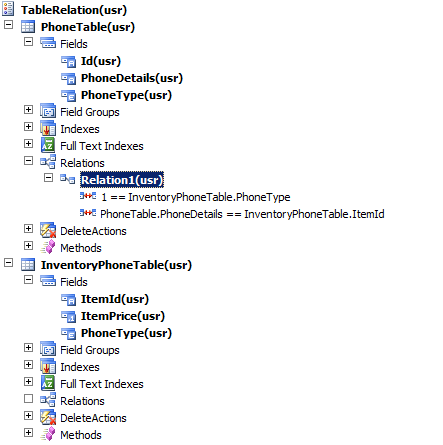 This relation restricts the records selected in the related table. Only records that meet the condition are selected. The condition is ANDed with your relation. Secondary table filtration can be done on the basis of relation set using related field fixed. Secondry Table:tableB(col4,col5,col6)-col5 is an enum & can contain values 0,1,2. It will give the lookup of 3 records of tableB i.e. 2,4 & 6th records. How did you create relation PlayersTable.PlayerBenefir=Footballer.footballcode? 1.The relations are basically used to build lookups is that right? 2.Also another thing, suppose if I change the values of a field which is linked with another tables, so by default will the values be updated to their linked tables?